But when Siris somehow succeeds where all those from his bloodline previously have failed, he finds himself cast into a much larger world, filled with warriors and thieves, ancient feuds and shifting alliances, Deathless immortals and would-be kings. His quest for freedom will take him on an epic journey in search of the mythical figure known as the Worker of Secrets - the one being in the world who can unravel the secrets of the Infinity Blade. 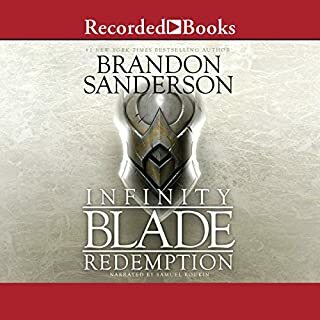 Based on the best-selling video game from ChAIR Entertainment and Epic Games, this all-new adventure from acclaimed fantasy author Brandon Sanderson digs deeper into the fantastical world of Infinity Blade, a world of mystery and intrigue where magic and technology are indistinguishable, and even life and death are not what they seem. 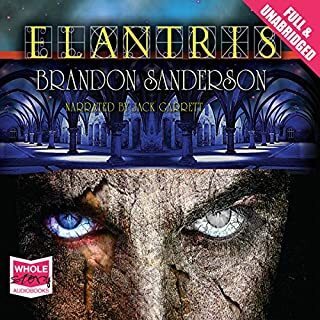 Brandon Sanderson has published six solo novels with Tor Books - Elantris, the Mistborn trilogy, Warbreaker, and The Way of Kings - as well as four books in the middle-grade Alcatraz Versus the Evil Librarians series from Scholastic. 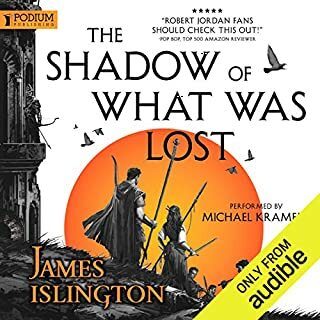 He was chosen to complete Robert Jordan's long-running Wheel of Time series, to which he added 2009's The Gathering Storm and 2010's Towers of Midnight, as well as the final book in the series, A Memory of Light, in 2012. Currently living in Utah with his wife and children, Brandon teaches creative writing at Brigham Young University. 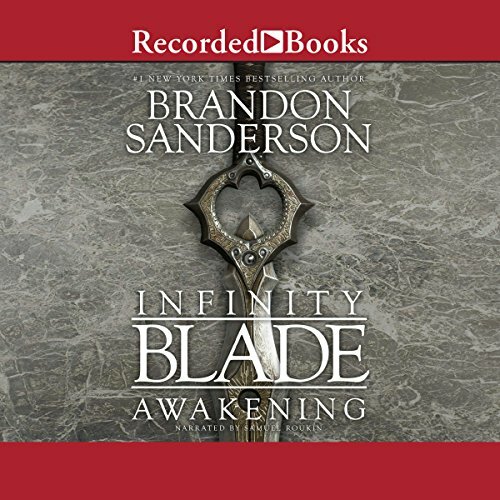 Where does Infinity Blade: Awakening rank among all the audiobooks you’ve listened to so far? 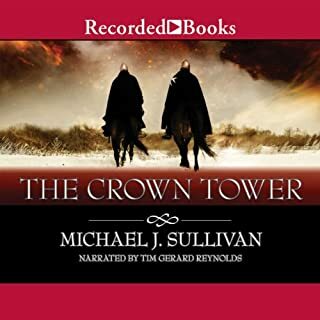 As a fan of the game, I found the story interesting and enjoyable, but I was disappointed in how short the story is, which I didn't realize when I bought the first book. 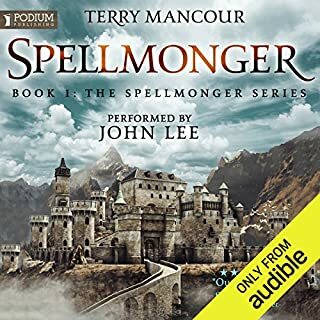 You basically have to buy the two books just to get one normal length audio book. I would love a continuation of this book. It felt too short and left me wanting more. 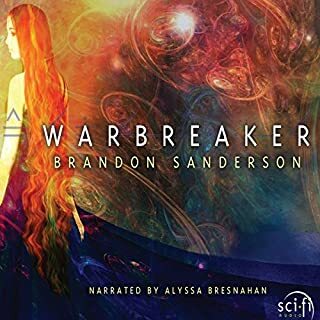 Brandon seems to either write for young new readers or for adult fantasy readers. This work to me was a little too simplistic and foreshadowing more prevalent than needed. There was less surprising discovery than his adult works. I enjoyed it, but felt I was led more than I needed to be. 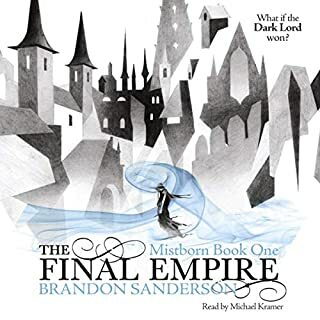 I would recommend this book to any Sanderson fan, like most of his books he left me wanting more! It was a great performance by the narrator he really had a penchant for the voices and made it seem very interactive. I bought this on a whim and wasn’t disappointed. Brandons works are always a delight to listen too. The book was under a bit shorter than most which is good if you dont have tons of time to listen to books. This great is fantastic. Really well developed as all of Brandon's books are, but it just did not last. it's a good read, but a little strange. I never played the video game, but still not too hard to follow. 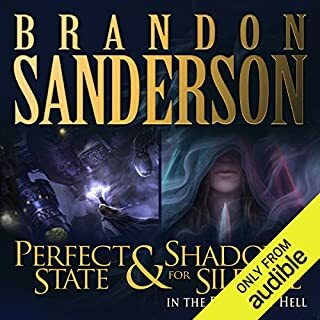 I like all of Brandon Sandersons books a lot. 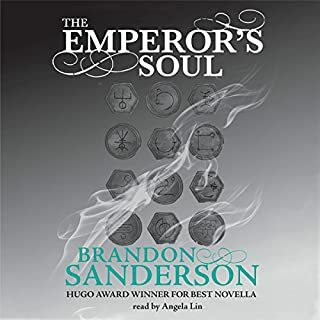 I am already a big fan of Brandon Sanderson's work, but in reading about this book, I found that it is based on a video game, or gives the background story to one. This made me wary since we all know that books or movies based on video games generally stink. I decided to get in anyways since the book is kind of short, and if it stinks, I'm not out that much time. I also saw that there are two books in the series. I could not figure out which one to read first. 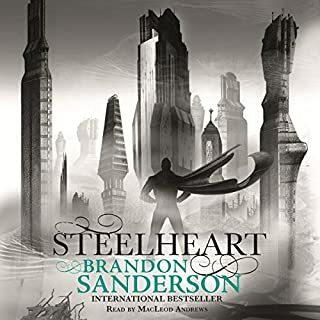 I read everything I could on brandonsanderson.com but still could not decide. I decided to go with this one since it had "Awakening" in the title. It sounded like it should go first. From reading some spoiler reviews, it seems that I guessed wrong and the other book actually goes first. I found it to be a great story. It had some really cool twists and I liked the overall flow of the plot. The characters were very interesting and likable. the story was interesting. it kept my attention the whole time. didn't seem to lag or bore me as any point. well written and very well performed. interested to hear the next one. I took a little while to get into this. Perhaps if you're a fan of the game "Infinity Blade" it may come more quickly to you, but I'm not a gamer and therefore probably missed some of the subtleties early on. 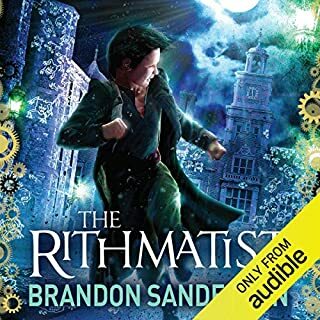 I wasn't sure how much of this world was straight from the game and how much was Brandon Sanderson's own world building, so I made my usual visit to Sanderson's website, and I quote: "My challenge was to take things placed into the game because of mechanics, and actually build magic systems, a world, characters, and a story to match them. The game developers had some ideas, but they told me I could do anything at all that I wanted." 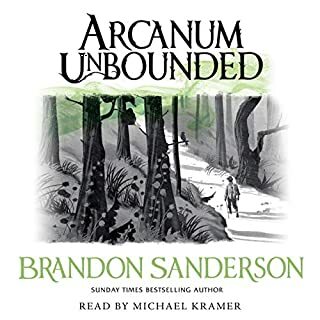 Typically, Sanderson's magic system seems properly hinged, and the world and characters he's created are rich. 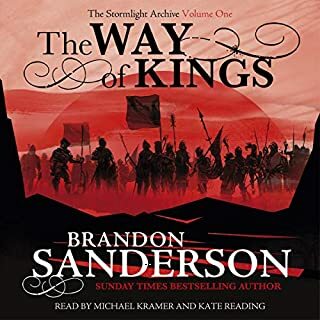 This has the potential to be another epic, although Sanderson suggests it's not going to be his defining series - he's just having some fun with it, (and taking us along for the ride while he does it). It has the usual ingredients of hero with a twist, a couple of swords, some interesting interlopers, and a nice great big twist. At one point, it even felt a little Jo Abercrombie-ish. Unfortunately, this is only 4 hours long so just as it was getting interesting, it all came to an abrupt end! (=minus one star). 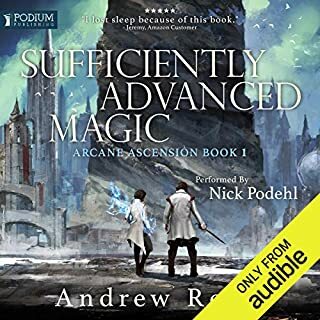 I have book 2 on pre-order, and I may actually have to download the game in the interim (not something I thought I would ever hear myself saying). This is another side to one of my favourite authors. 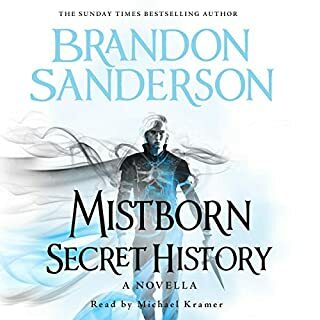 Having recently completed the mammoth Oathbringer and read a couple of his short stories this near-novella format surprised me. Of course Robyn has the full SP in her review and I think while this is decent writing and has lots of nice ideas in it the brevity stops it from being fully developed. 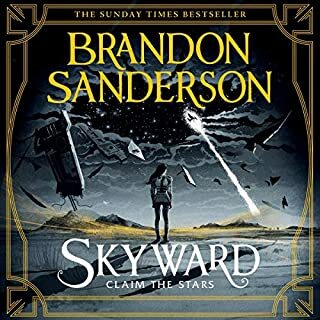 Of course it is just the first in a series and so it could get fleshed out but this very much felt like a diet version of Sanderson to me. 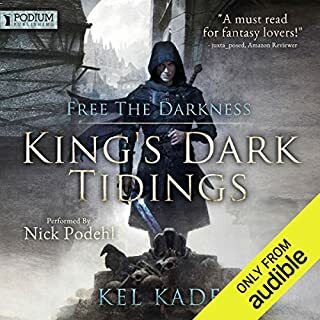 On the other hand the clever mix of technological awareness is well done creating both a sci-fi and fantasy feel within the book and Samuel Roukin does a good job with the narration so it is worth a listen. It's just not really up there with the best in the two genres. 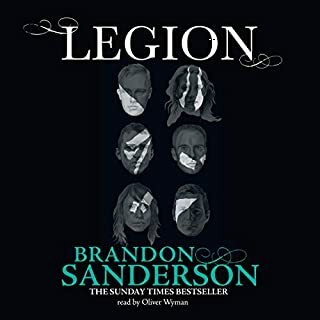 I certainly wouldn't recommend it as one to judge Sanderson's overall awesomeness by even though especially in the combat scenes there is some very inventive trickery going on which gives a flavour of this author. As Robyn says, even Brandon likes to just have a little fun sometimes. Fantastic narration of an enjoyable piece of work! Looking forward to more of the same.